Slow Nomads - Page 2 of 32 - You're not lost until you panic. As the taxi pulled into the drive of Pri Lenart, Zana came out and warmly greeted us with a big, cheerful smile. Such was the start to several days of wonderfully challenging walks over some of the hills and mountains of Slovenia. Though Slovenia is a small country, it isn’t lacking in interesting things to see or places to visit but, we didn’t have an automobile, and many places are essentially inaccessible by public transport. As we departed Trieste, Italy, I eagerly scanned the roadside for the first indication that I had entered the country that my Dad’s ancestors came from, and only two generations removed. The longer we stayed here the more we came to appreciate the origin of the name Ljubljana. 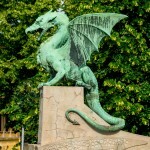 The most popular belief is that it derives from the word Ljubljena, meaning “Beloved”. And we agreed. It was finally time to leave Verona. After double-checking the time and platform, we boarded our train right on time and settled in for Trieste, Italy. A new set of adventures lie ahead, and our excitement is growing. After our delightful trip to Bergamo, it was time to get serious about packing and getting ready to depart Verona, a place that for two months has become familiar and comfortable, and that we have been calling home. Italian automotive aesthetic mastery has been exemplified by sleek elegance, understated, clean beauty and an innovative style. It has admirably carried on the tradition and elegance of classic Italian art. We had planned a visit to Bergamo (pronounced BARE-gah-mo), and we knew that it would require an overnight stay, and for good reason, the city was truly a medieval gem. They say that accidents most often happen within 40 km (25 mi) of home. Not always, and that can add a whole different dimension. This post was penned by my brother Michael.